I’ve been called “Sir” twice in my life. The first time was when I was working at a tuxedo rental shop. I was wearing a polka dotted dress and looking very much like a lady. But after this guy was all sized up for his tux, he said, “Thank you, Sir”, and scurried out. He returned momentarily and gave me a dollar for a tip … I think he was just giving me a dollar because he felt weird about calling me sir. The second time was yesterday. I called Roast to find out what their beast of the day was (aka the freshest meatiest meat ever that they switch up daily). After asking the lady on the phone, she put me on hold and came back on the line saying “Sir, it’s suckling pig.” So there you go. This has nothing to do with these marshmallows except that maybe these are the lady of the marshmallow world. I wouldn’t call these marshmallows “sir” unless they had a teeny mustache and a monocle. I would call these delicious though. Rumor has it they are amazing in hot chocolate. I have yet to try it, but I’d be a fool not to, right? Generously grease a 9×13 inch baking dish. Dust the whole thing with sifted powdered sugar. Pour 1/2 cup cold water into the bowl of a stand mixer. Sprinkle gelatin over it and set aside for 10 minutes. Meanwhile, combine the sugar, corn syrup and 1/4 cup water in a medium pan. Bring to a boil until the mixture reaches 250 degrees F on a candy thermometer, stirring now and then. Turn on the mixer to low speed and slowly pour in the hot sugar mixture over the bloomed gelatin. 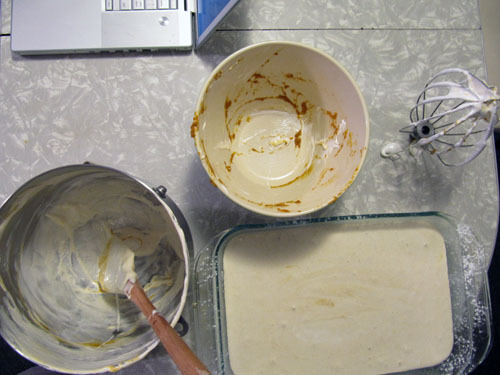 Add the salt and turn the mixer up as high as you can without hot sugar splashing out … gradually work up to high speed. When the marshmallows stop increasing in volume (after abut 5-6 minutes), add the vanilla extract and beat until combined. In a small bowl, whisk together the pumpkin and spices. 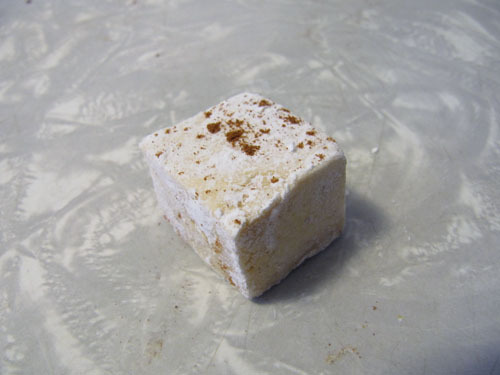 With a rubber spatula, fold into the marshmallow mix. This will be tricky, but don’t worry if some streaks remain. Pour the marshmallows into the prepared pan and smooth the top with a spatula. Set out at room temperature uncovered over night. 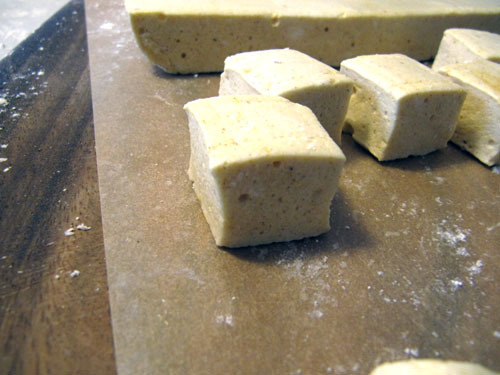 In a small bowl mix together 1/4 cup corn starch, 1/4 cup powdered sugar and a generous sprinkling of cinnamon. Turn the pan out onto a surface dusted with powdered sugar. Cut with a sharp knife, pizza cutter, or cookie cutters dusted with powdered sugar. 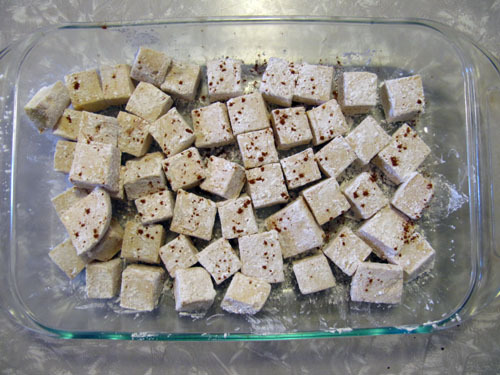 Roll marshmallows through the powdered sugar mixture and place in an airtight container until ready to eat. Sprinkle with additional cinnamon to taste. I just know you’re love these, Sir! They are heaven. 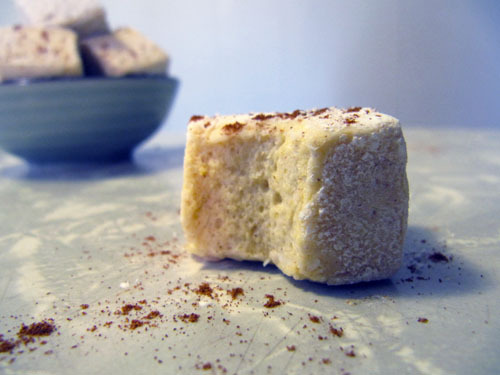 i’ve never tried making marshmallows yet these look delicious! pumpkin is perfect for fall! Oh sir, I think I may make these! You probably should! They are amazing. Oh my, these sound so PERFECT!!! I’m kind of a pumpkin spice addict, haha! These look like soft, pillowy pumpkin goodness! I bet they’d be awesome in hot chocolate. I love the sir story about Roast. I think it may be the word “sir” matched with the phrase “suckling pig”. I’ve actually read about that place! I think Patrick may have tried it before when he was visiting his family in Detroit. Hey Beckie, these guys are dreamy in hot chocolate. I finally tried them that way today! Maybe you’re right. I guess a “sir” might be assumed to be more curious about suckling pig. 🙂 That’s cool that your boyfriend has been there! I’m taking Jake there for his birthday. I can’t wait.